But more recent dietary guidelines have loosened the reins on dietary cholesterol. One Chinese study even found that having an egg a day might lower the risk of heart attacks and strokes, according to the American Heart Association (AHA). However, that study was done on people who weren’t eating a typical Western diet. Mickey Rubin is executive director of the American Egg Board’s Egg Nutrition Center. So, is there a simple answer to whether you should be eating eggs or not? It’s a toss-up. Eggs are a good source of nutrients, such as protein and vitamin D, the AHA says. On the flip side, this breakfast staple also delivers a significant dose of dietary cholesterol. Basically, it all boils down to this: Eggs — in moderation — can be part of a healthy diet. For example, a chopped-up hard-boiled egg in your salad is probably fine, because the rest of the food is low in cholesterol. But you might want to rethink a daily habit of a couple of fried eggs, especially if they’re topped with cheese and come with a side of bacon or sausage. “No one food is just cholesterol. There are good parts to foods and bad parts. Moderation is the key,” Allen said. 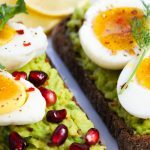 Dr. Terrence Sacchi, chief of cardiology at New York-Presbyterian Brooklyn Methodist Hospital in New York City, said this study is a “wake-up call not to overdo high-cholesterol foods. This is just one study, so to give up eggs altogether would be extreme.” He was not involved with the research. “Eggs are a good staple. You’re getting a lot of protein, though you can get that from egg whites too. There are a lot of other nutrients in the yolks as well,” Sacchi said. Here’s what the American Heart Association has to say about eggs.